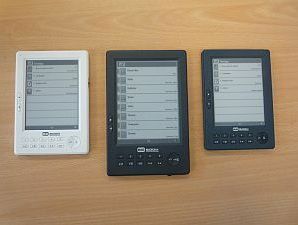 Dutch company Endless Ideas has just released the first pics and details of its new mini electronic reader, the BeBook Mini. The BeBook Mini e-book has a handbag/manbag-friendly 5-inch screen (shaving an inch off the original screen size) and will be made available in black or white. No official word on release date of the BeBook mini yet, but the company has announced on its Twitter feed that it should be available within weeks. TechRadar is assured we should see the full-sized, touchscreen, Wi-Fi capable BeBook 2 over in the UK sometime around August. Endless Ideas' BeBook Mini is set to feature a faster processor than the first BeBook, as well as an SD memory card slot, a USB port and the full-sized BeBook 2 set to follow later this summer will also feature touchscreen and Wi-Fi functionality. The BeBook is manufactured by Chinese company Tianjin Jinke Electronics, which also sells readers under the Hanlin brand. BeBook Mini will also be made available in the far east as the Hanlin v5 Reader. TechRadar has contacted Endless Ideas' UK PR company for further details on pricing, which looks like it should be priced around $200 (£135) or less according to Wired. For more on the first BeBook, check out TechRadar's review.